Halle Berry as an actress is a source of enormous frustration to me. When she buckles down and does the work she can be a truly compelling professional whose performance reaches amazing levels. She impressed me way back in 1995’s “Losing Isaiah” and 1999’s “Introducing Dorothy Dandridge”. I wasn’t at all happy with her as Storm in the X-Men movies but that was more miscasting than anything else. I still don’t see what everybody else saw in “Monster’s Ball” but that probably because I can never stay awake until the end. And I think she forgot in “Die Another Day” that James Bond fans go to see James Bond because he’s supposed to be the star of the movie. Not the Bond girl. So yeah, that’s why Halle Berry frustrates me. I think there’s a genuine love of acting there and I believe that she’s yet to produce a truly great performance that equals the one she gave in “Introducing Dorothy Dandridge” which remains my favorite of her movies. But until she does produce that great performance, FRANKIE & ALICE is a respectable placeholder. Frankie Murdoch (Halle Berry) is a stripper in a L.A. men’s club during the 70’s. Like you would expect, she’s sassy, loud, full of herself and a living volcano of sexual energy. But she’s also a very troubled woman. She’s always behind in her rent because she writes checks and can’t remember when she wrote them. She has clothes and wigs in her closet she doesn’t remember buying. Hearing certain sounds or songs on the radio trigger attacks of repressed memory that result in fugue states where Frankie’s body is taken over by one of two other personalities: Genius, a seven year old child whose I.Q rivals that of Einstein. And Alice, a racist Southern white woman. Yeah, you read that right. 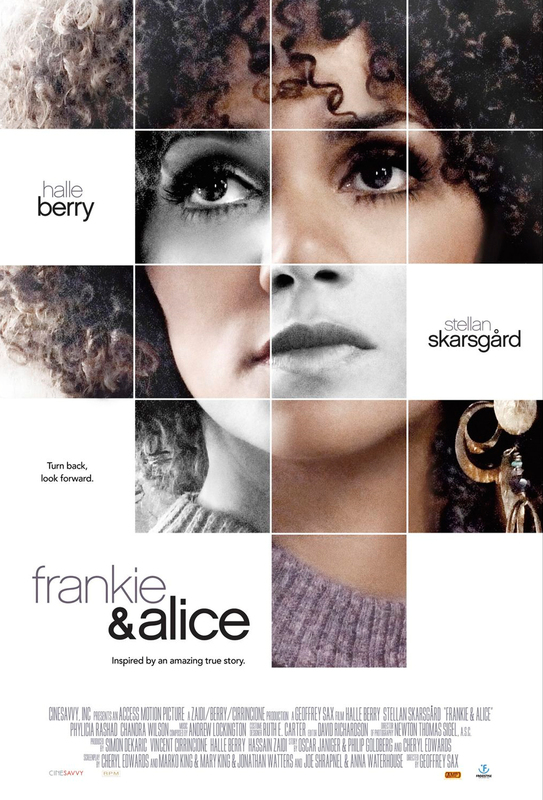 What complicates the situation is that while Frankie is unaware of Alice’s existence, Alice knows all about Frankie and detests the fact they have to share the same body. Luckily Frankie comes into the care of Dr. Oz (Stellan Skarsgard) who is reluctant at first to take her case. But the more he talks to her, the more he realizes that she can help him prove his theories on dissociative identity disorder. It’s a theory his immediate supervisor Dr. Strassfield (Matt Frewer) isn’t too sure about. Given Frankie’s lifestyle, her drinking, sexual promiscuity and drug use, Dr. Strassfield naturally thinks she could be faking just to get out of serving a stiff jail sentence. It’s up to Dr. Oz (I swear that’s the character’s name, I’m not making it up) to probe the deeply buried memories Frankie herself has forgotten. And through hypnosis he doggedly peels back the layers of Frankie’s life to expose a series of truly nightmarish events that caused her condition. Now before you get all excited let me say right up front that FRANKIE & ALICE is a movie that back in the time period its set in would have been an ABC Movie of The Week. Because that’s what I felt like I was watching. Don’t get me wrong. It’s not a bad movie. Matter of fact, it’s pretty good. Halle Berry and Stellan Skarsgard perform like the professionals they are and the relationship between their characters is warm and feels real. Phylicia Rashad also turns in solid supporting work as Frankie’s mother who harbors some pretty dark secrets of her own. But it’s not a really compelling movie that I can give it a Must See recommendation. But it is a respectable and competent piece of filmmaking that demonstrates more than anything else that when she wants to, Halle Berry can act and act very well indeed.